Help Share $100,000 with Hawai‘i Island Schools details on page 3. Enjoy with french fries! Heinz Tomato Ketchup 32 oz. SUPER COUPON Libby's Vienna Sausage 18 cans, 4.6 oz. ea. Good August 1 to 7, 2018 Without cpn 8.99, Limit 6 per cpn. 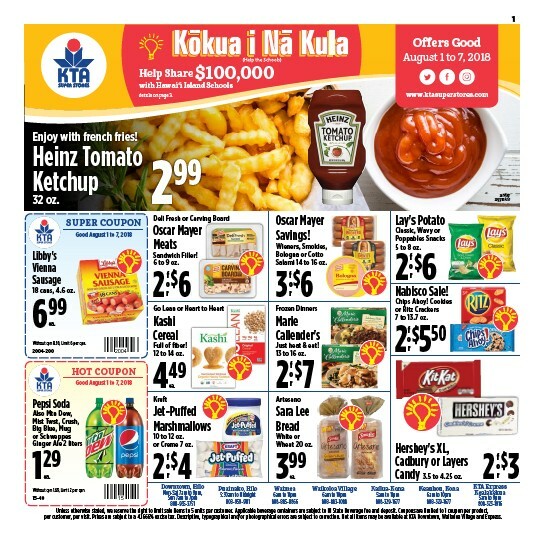 2004-200 HOT COUPON 1 Offers Good August 1 to 7, 2018 www.ktasuperstores.com Lay's Potato Classic, Wavy or Poppables Snacks 5 to 8 oz. 2 $6 2 $550 Deli Fresh or Carving Board Oscar Mayer Meats Sandwich Filler! 6 to 9 oz. Oscar Mayer Savings! Wieners, Smokies, Bologna or Cotto Salami 14 to 16 oz. for Go Lean or Heart to Heart Kashi Cereal Full of fiber! 12 to 14 oz. for for Frozen Dinners Marie Callender's Just heat & eat! 13 to 16 oz. ea. Kraft Jet-Puffed Marshmallows 10 to 12 oz. or Creme 7 oz. Nabisco Sale! Chips Ahoy! Cookies or Ritz Crackers 7 to 13.7 oz. for for Artesano Sara Lee Bread White or Wheat 20 oz. Hershey's XL, serving suggestion 2 $4 399 Cadbury or Layers $3 Candy 2 3.5 to 4.25 oz. Keauhou, Kona 6am to 10pm 808-329-1677 for KTA Express Kealakekua 5am to 9pm 808-323-1916 Kailua-Kona 5am to 11pm 808-329-1677 2 $6 3 $6 449 2 $7 Waikoloa Village 6am to 10pm 808-883-1088 ea. Waimea 6am to 11pm 808-885-8866 Puainako, Hilo 5:30am to Midnight 808-959-9111 299 for Downtown, Hilo Mon-Sat 7am to 9pm, Sun 7am to 7pm 808-935-3751 699 Good August 1 to 7, 2018 Pepsi Soda Also Mtn Dew, Mist Twst, Crush, Big Blue, Mug or Schweppes Ginger Ale 2 liters 129 ea. Without cpn 1.69, Limit 2 per cpn. 15-40 Unless otherwise stated, we reserve the right to limit sale items to 5 units per customer. Applicable beverage containers are subject to HI State Beverage fee and deposit. Coupons are limited to 1 coupon per product, per customer, per visit. Prices are subject to a 4.1666% excise tax. Descriptive, typographical and/or photographical errors are subject to correction. Not all items may be available at KTA Downtown, Waikoloa Village and Express.